Did you know Hawaii is about to explode on the chocolate scene? I didn’t either — until I took a factory tour at Manoa Chocolate Factory! It all started with a busy Mom (me) trying to find things to do with her children over holiday break. So, when a discounted chocolate factory tour popped-up in my research, I decided to give it a whirl. And, I’m so glad I did. 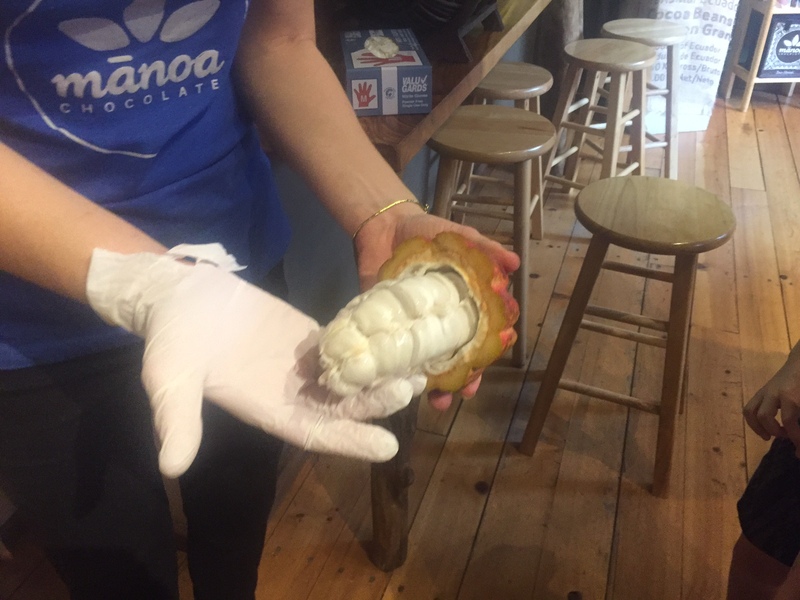 Your tour at the Manoa Chocolate Factory starts with the basics - learning about the cacao pod. Before you book, you should know that Manoa Chocolate Factory uses the term “factory” pretty loosely here. The establishment is quite small — but, yes, technically, this is where they produce their chocolate. Our tour started with an enormously interesting look at a cacao pod. In fact, the staff member had harvested the pod that very morning! 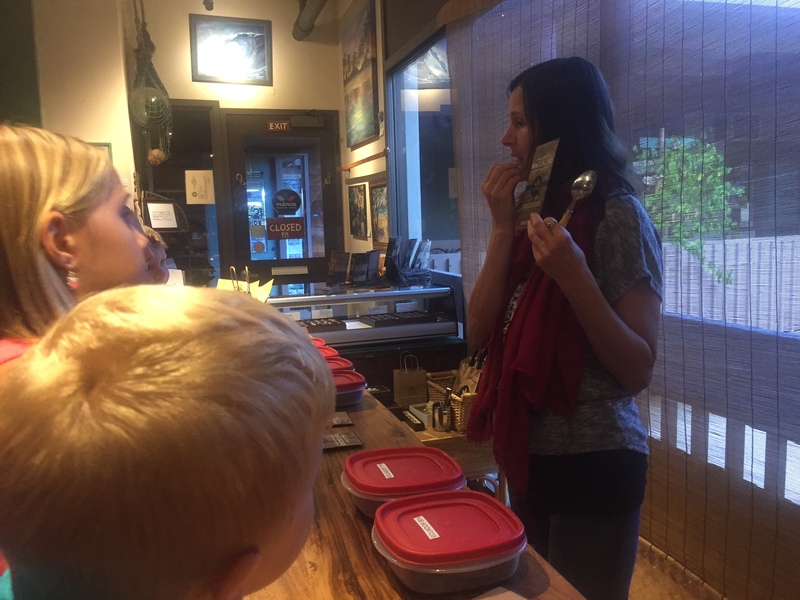 She broke open the pod to reveal the cacao seed, and all of us had the opportunity to try it. I must say — this was an unexpected surprise. The Manoa Chocolate Factory Tour is a great way to spend an afternoon learning about Hawaii's chocolate industry. From there, our guide took us to a room in which we tasted cleaned seeds from different places around the world. The kids didn’t love the taste, but they absolutely devoured the experience. From there, we learned all about the process of chocolate making, from the seed to the husker to the grinder to the finished cacao powder. I suppose I’d never pondered how many steps it took for a seed to get to my finished candy bar! What was especially fun was the anecdotal nature of the tour. At one point, the fledgling chocolate factor in Hawaii couldn’t afford to buy an expensive, but essential machine. So, they improvised. With the help of a bike and a power tool, they were able to “make-do” until they had the money for the larger machine. Now, THAT’S expanding my kids’ horizons! 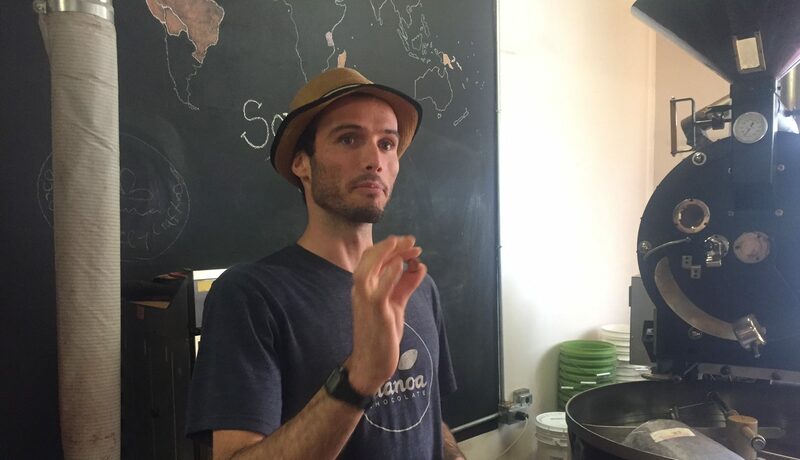 The Manoa Chocolate Factory tour teaches guests how to make chocolate from seed to store. After learning the operational part of chocolate-making, we learned more about “milk-chocolate” and the different “percentages” of cacao in chocolate. As we listened, a staff member actually “made” the liquid chocolate in front of us and showed us how the liquid becomes bars. If you ask the kids in our group, the best part of the chocolate tour in Hawaii was tasting (OK, it was my favorite, too). Since this is such a small operation, I assumed our tasting would be limited. But, it wasn’t! Instead, we were offered about twelve different chocolates to taste, as the staff member explained each one. Have you ever tried chocolate tea?! Go here, and you will! My kids' favorite part of the tour was the tasting during which guests can taste up to 12 different kinds of chocolate. Our Manoa Chocolate Factory Tour was an unexpected surprise and proof that you never know what you’ll get until you try. 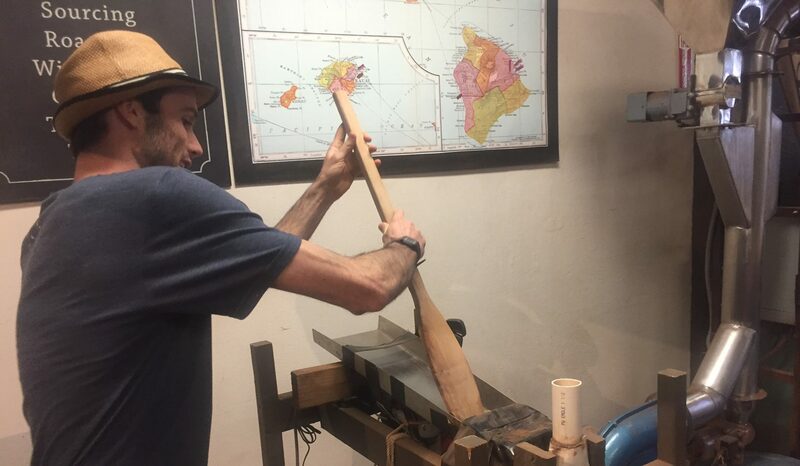 As you fill your Hawaii vacation with sun-and-surf Hawaii activities, like parasailing, kayaking, and surfing, don’t forget to treat yourself to an out-of-the-way learning activity like this!